High-performance Statistical Queries using Self-joins | Insights on Authentic Intelligence – Bob Leithiser, Ph.D. 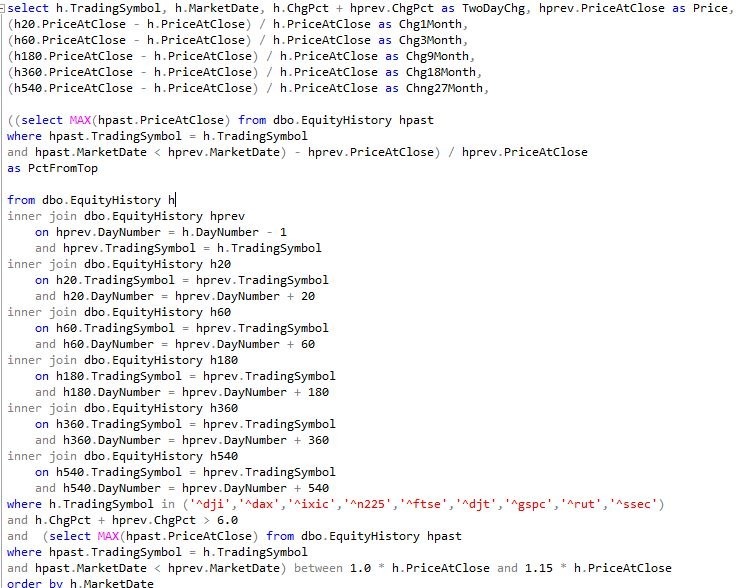 In my pursuit of understanding asset markets, I’ve maintained a SQL Server database with a lot of information about the stock market and other indexes. Using some data services along with SSIS, this database has been kept current to the point that it now has over 3 billion records in total including 2.3 billion records in an intraday table. Most of my queries and interest concerns cumulative equity and index end-of-day history which is only 75 million row and the options data since 2003 which is now up to 175 million rows. To be able to query this level of data, I utilize Fusion-io PCIE SSD storage for the SQL Server database. Using self-joins can produce some very interesting analysis. For example, the below query outlines the performance of a few global indexes where there have been large bounces close to market tops and the ensuing performance afterwards. This query complete in just a few seconds. There are couple of tricks that make this run faster – one is the storing of a relative day number to avoid performance issues with working around weekends for querying prior dated history. The day number is sequential across holidays and weekends so a direct link can be done without a range test. The other trick is that the table is partitioned based on the date which allows a good deal of parallelism. This is not a good omen for the stock market for the next couple of years based on history. There is probably not enough data here to draw conclusions, but since the query is against indexes rather than individual stocks, it does seem pretty convincing. It is pretty certain that a query against the entire equity history for this would yield similar bottom line averages, but that would take several minutes to complete.